Last night, the television in the restaurant was turned to a news channel that was talking about Obama. Some of the local men know that I am American, so they asked me for my opinion on the leader and his impact on the world. When it was their turn to share, one man told me that he cried when Obama was elected president. Snapshot of the Obama Optical Illusion Belt Buckle. Mtakataka Turnoff, Malawi. Even though America has nowhere near the largest population in the world, the country still impacts the world in very real ways. One of those ways is through who the citizens elect as president, because the president’s foreign policies affect people the world over. As such, people all over the world, in big cities and small villages, are interested in American elections. This election, from what I’ve heard from Malawians time and again, was particularly interesting because of Obama’s connection with Africa. The man who told me that he cried tears of joy when he heard the news of Obama’s election also told me about the celebrations he witnessed in Malawi. People danced, cried, and hugged in the streets, singing praises to Obama and the American people who freed not only themselves, but the rest of the world as well. Those were his words, not mine, though I do agree with him. 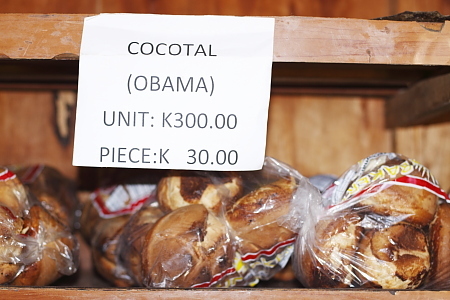 Snapshot of some Obama bread. Monkey Bay, Malawi. Around Malawi, I’ve only seen a few small pieces of graffiti about Bush, all of them casting him in a very negative light. In place of most of the old graffiti, you can now find beautiful murals with Obama as the honored subject. Besides the colorful walls in the market alleys, you can find Obama’s presence reaching deep into the culture. I could continue to list sound bites from people who have told me of the joy and the hope they still feel when when they think of Obama and I could tell you about how, upon learning that I’m American, the non-English-speaking locals will throw out their arms, toss back their heads, and yell, “OBAMA!” with the biggest smile on their face. But I think the best way to show how much the local people love this leader (who isn’t even theirs!) is to show you some of the ways they continue to pay homage to him. Snapshot of Magic Obama Strawberry Flavored Bubblegum. Mtakataka Turnoff, Malawi. At the bus stations, it’s not uncommon for some of the vendors who are wandering around to shout to the bus passengers that they have Obama for sale. Other times, you’ll hear the passengers yelling first, bartering for an Obama or two. The Obama that has become a best-seller at the bus depots is not a man, not even a figurine or a poster or a sticker; it’s a type of bread. Two years ago, the bread was known by a different name, but in the last five months, I’ve never heard it referred to as a “Cocotal,” and I’ve only seen it written on signs twice. 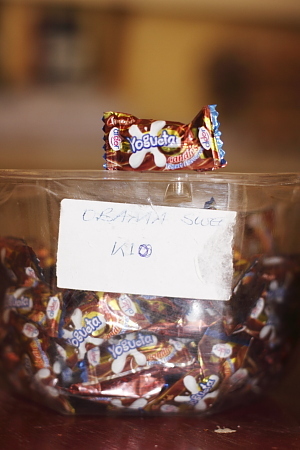 In the small grocery stores, the cashiers often tell me that they also have chocolates, sweets, and Obamas for sale. In this context, an Obama is a piece of strawberry-flavored bubblegum. Some stores even call other sweets “Obamas,” even if they aren’t Obama-branded, because the name has such a favorable connotation and has become a great marketing keyword. The gum has become so popular that I’ve even seen t-shirts advertising the “Magic Obama Strawberry Flavored Bubblegum,” complete with the smiling face of the American president across the front. 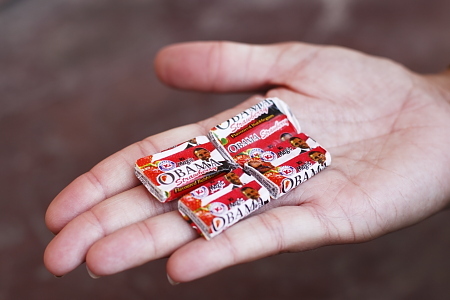 Snapshot of re-branded Obama sweets. Monkey Bay, Malawi. Other items of clothing are Obama-themed, but they are more rare. While riding in the back of a pickup truck, I saw one man wearing an old pair of cowboy boots on which someone had stitched the top with Obama’s name. As cool as those were, my favorite was the belt buckle I found in a small road-side stall. It was one of those optical illusions, so when you look at it from one angle you see a picture of Obama giving a speech in front on a plain background, but from a different angle you see him smiling in front of red and white stripes. 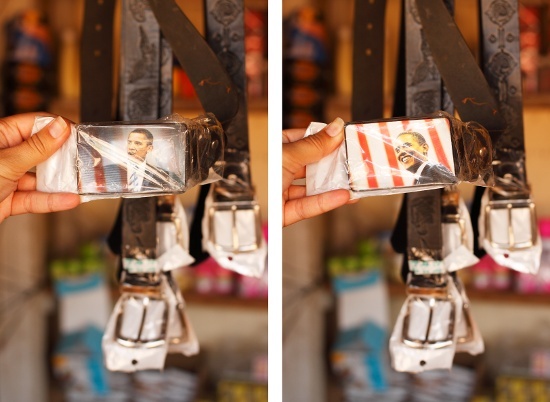 It was, by far, the coolest piece of Obama-impact I’ve seen so far, but I will still keep my eyes open for any other pieces of Africa’s Obama that continue to permeate the local markets.